*DRIVERS: We need your help! The Workers’ Center of CNY and the Worker Justice Center want to invite you to Join us on May First, International Workers Day, to deliver a letter to the owners of one of the biggest farms in the region demanding a stop to violence against workers. We will rally and show our support for dairy workers. Join our efforts and add the name of your organization to the list of groups that support agricultural workers. On March 24th 2015 a dairy worker was dragged and severely beaten up in plain sight by the manager of the farm where he works. This is not an isolated incident. Too often, workers are treated with verbal and physical violence and work long hours under precarious conditions with low pay. Worker leaders from the May 1st. 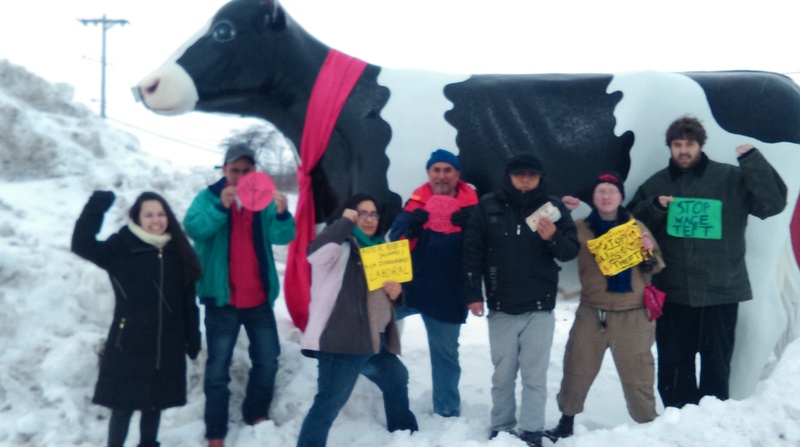 Farmworker Committee, together with those from the farm where this incident occurred, are asking allies to join and work towards dignity and respect for all New York state dairy farms. We will leave from the Syracuse Area at 8:30 am and meet in Lowville, NY. We encourage all to carpool and also to invite any friends who live close to Lowville, NY to be there. Even if you can’t make it to the rally on May 1st. you are invited to a sign making party on Thursday, April 23 at 6pm (Plymouth Church of Syracuse). Organized by the Workers’ Center of Central New York and the Worker Justice of New York.